NBA | In the Key of "H"
The N.B.A. technically stands for National Basketball Association. Of course over the years it has also stood for other things like “Nothing But Actors.” But this year, particularly during the playoffs it will not stand for acting any longer. Even bigger named (and even bigger whining) players like Lebron James have been fined $5,000 for “flopping.” Soccer players have done this for years and it drives me nuts, but the NBA, is attempting to do something about it. Now I know taking $5,000 from Lebron is like taking away a napkin from the “rest of us,” but it’s a start. I think. Flopping can give one player quite an advantage over his opponent. By faking or exaggerating the result of contact, he can get the ball back and cause his opponent to be called for a foul at the same time. It’s better than a simple turnover. And it often times works, until now, supposedly. But it is completely disingenuous and harms the integrity of the game (though I rarely watch NBA so this is more of a hypothetical for me). Sometimes I think Christians are guilty of spiritual flopping, over-reacting and even acting at times. There is always going to be contact in basketball. That’s part of the game. There is always going to be contact in a church (at least in a healthy church where people spend time with one another!). And just like in a basketball we will bump into each other; often times that contact is simply like two guys going for a rebound, or “boxing out” or “posting up.” It is just part of the game. Feelings will eventually get hurt-how could they not when you put a bunch of broken idiots together in a room? I’m not excusing sin or insensitivity, just reminding us not to be surprised when it happens. In Ken Sande’s Peacemaking steps, the first step is to overlook an offense. In order to overlook an offense, we probably would do wise to consider the actual contact we received. Was it really a vicious intentional elbow (as it really felt at the time), or simply the normal contact that goes on in a game? Some have been “flagrantly fouled” a time or too and so it is legitimately hard to trust again. 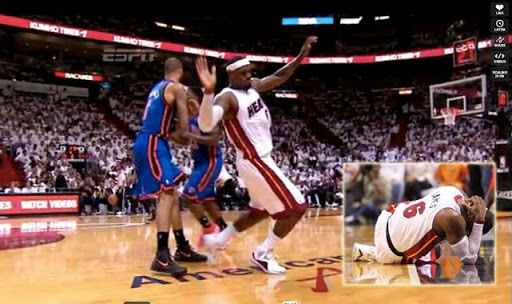 But for others, flopping might be more commonplace and have developed into a life long habit. I know I’ve flopped a time or too along the way, reacting as though someone had thrown a cheap shot my way. In reality, that wasn’t the intent at all. We’ve all flopped, and then moped-though some of us do so more privately or in the privacy of house and home. If there’s one thing we can learn from the NBA it is that flopping, which is ultimately disingenuous over-reacting and at times acting to gain an advantage over another, distracts us away from the real work going on inside and outside the four walls of a church. Yesterday, in a fairly meaningless NBA game (most of them have lost meaning to me at least….) the artist-yes he did record a rap album-Ron Artest apparently threw a vicious (he claims it was an accident) elbow to the head of James Harden. It left Harden lying on the floor with a possible concussion. 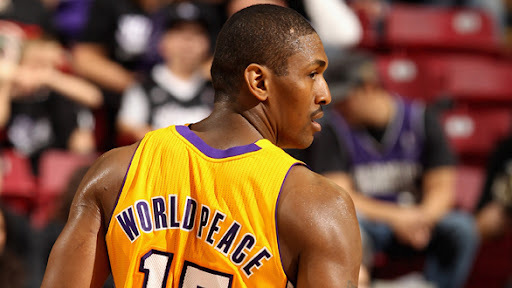 The ironic part of this whole thing is that Ron Artest recently changed his name to Metta World Peace. Of course the non-ironic part of this is that Artest was once suspended more than 80 games for charging into the crowd and fighting Detroit Pistons fans a number of years ago. But let’s just consider it ironic, that a man who desires world peace enough to change his name to it, would then assault an opponent-not a bitter enemy-on the floor. I’m not judging Artest/World Peace for it either, as I wouldn’t trust myself on the floor. Still, isn’t it a little ironic that someone would advocate world peace enough to change his name to it, and then assault his neighbor? I’m for world peace, but I’m not for peace on the basketball floor. I’m for world peace, but not for local peace. I don’t know anyone who has had such a passion for world peace that he/she has changed his/her name. I also don’t know anyone who has had such a passion for world missions that he/she has changed his/her name. And of course they shouldn’t. But I have known people who have a passion for world missions, but don’t have much of a care for those folks in their paths now. I’ve seen churches who are good “senders,” but they are cool with their neighbors going to Hell. And that to me is just as ironic as Metta World Peace elbowing an opponent on the floor. God grants us different gifts, passions, and emphases. For instance, some have a bent toward youth ministry, foreign missions, church planting, local mercy ministry. And that is beautiful. But it is ironic for a church planter to ignore foreign missions. John Piper once said something to the effect of “being missional without a concern for foreign missions is not missional enough.” Well said. Local missions can never have as its end local missions. It should play a part in the nations bringing the glory due God’s name. But those same churches and members who have a passion for foreign missions have a mission field that is also local until they leave. Now of course individuals won’t have the same passion locally as they do for a destination and a people overseas. They shouldn’t. But a pastor once shared some fantastic advice at a time in my life when I felt precarious about my future: “Just ask who does God want me to minister to today?” I’ve never forgotten that. Thinking about who we may minister to today will keep us from solely focusing on who we will minister to tomorrow. Whether your bent is youth ministry, mercy ministry, foreign missions, children’s ministry, or no ministry, don’t ignore who God puts in your path today. After all, you technically never “arrive” at “tomorrow.” That’s probably why Paul reminds us, “Now is the day of salvation” (2 Cor 6:2). Ignoring those who God puts in our paths today may not put us on ESPN or get us suspended from the NBA, but it still falls short of the joy we can have when we align our purposes, passions, schedules, and even opportunities, with God’s Kingdom purposes in His world. I’m thankful for dear friends who have a passion for foreign missions, but have continued to minister to their fellow employees until God sends them out. Both WV and ________ when they get there, will be better off because of them. And I am too. In light of yesterday being Father’s Day, I thought I’d share one NBA player’s fatherly thoughts. Dwayne Wade was recently awarded full custody of his kids, and reflects upon the glory and opportunity of being a father. He described fatherhood not simply as an opportunity but also as a necessity, reflecting upon his own father’s example to him. All children need their fathers, but boys especially need fathers to teach them how to be men. I remember wanting that so badly before I went to live with my dad. I wanted someone to teach me how to tie a tie and walk the walk, things only a man can teach a boy. Dwayne Wade is definitely on to something here. Moms can teach lads to tie ties, but exactly how to “walk the walk,”is something best taught by dads. I found Dwayne Wade’s take on parenting particularly appropriate given the backdrop of athletes, like one N.Y. Jets defensive back, who has so many kids (with different women) that he actually couldn’t remember all their names. That’s pretty sad. At one point, the NBA comprised a number of people like him, when it was regular for NBA dads to have kids with different last names. I hope that we can see more Wade’s and fewer Shawn Kemp’s. I even felt challenged by Wade’s fatherhood. My dad and I bumped heads a lot—we were so alike, both of us born competitors. My older son, Zaire, is exactly the same way. We’ll battle on the court when I’m 39 and he’s 19. He’s 9 now, and he’s grown up with basketball. Zion could take it or leave it, which is cool by me. Dwayne seems to have had a decent dad. But what about kids without Dads due to divorce, death, or because they are deadbeats? Is there hope? Are they doomed to repeat the cycle? While many folks do fall into that pattern, the gospel does offer us hope. Seriously, and practically. I’ve seen folks who have had bad dads or no dads at all become good dads. So I know its possible. And here’s why I think its possible. 1.) There are plenty of unbelieving good dads, but one way Christians have a “leg up” on the “competition” is that we take our cues from a Heavenly Father. We can know what a good father looks like because we have a good Father in heaven (Matthew 7:11). God provides for his children, therefore we provide for our children. God invites us into a special relationship with Him allowing us to call him “Abba” (Rom 8:15 ), therefore our kids ought to have a special relationship with us. A special relationship that our neighbors’ kids will not get. While we don’t necessarily share the same sense of “abba” as Jesus did since he is the eternal Son of God, we do have a special familial closeness now. There is a special backstage pass our children are granted. They have special access. Our sonship is distinct from Jesus, yet it is nevertheless real. So real that we have an idea of what a Father looks like. Some folks don’t like using language of God as a “Father,” because they read back into our Heavenly Father the baggage from our earthly fathers. But it is more than just feminists who’ve had bad experiences with their fathers. Even bible translators as part of “Insider Movements” have begun to translate the word “Father” as “Guardian,” because it is more palatable for Muslims. But I think we miss something of our Heavenly Father when you take away that word/concept, and my denomination seems to agree. 2.) I think there’s another resource a Christian can draw from when discerning how to be a good father when he himself didn’t have one: the church. We know what good dads look like because we can see them. We can ask them questions. We can learn from their mistakes, as well as their wisdom, which naturally come best through their mistakes. But even those of us who don’t have fathers, can find a number of fathers in the church. Good fathers have the opportunity to be a father figure to kids who may have never had one. There is hope to break the cycle of bad dads in this world: good news in a world without a shortage of them. If you’re of those who follow the NBA playoff’s, you’ll know that the L.A. Lakers received a very poor Mother’s Day present from the Dallas Mavericks: a near 40 point “beatdown.” Sometimes we need a “villain” to keep things interesting: the Lakers were that “villain” to me: someone to root against. Now, I just don’t care. While I don’t offer you any suggestions on a team to pull for in the play-off’s, I do offer you a player to pull for in the next NBA season, should they have one. It is very clear that very soon the NBA will head the way of the NFL and players will be locked out. So, provided there is an NBA season, or a shortened season next year, here is a lad whom you will want to root for: Chris Paul. I knew New Orleans Hornets point guard Chris Paul was a believer; after all, he was on the cover of the Sports Spectrum (a Christian sports magazine). In fact, he was on the cover of the most famous Sports Spectrum volume, the edition containing sports-related devotions by a host of athletes, coaches, and an associate pastor (ME). My name looks a little out of place alongside Indianapolis Colt’s Center Jeff Saturday. So that edition, in the minds of many, will forever link Chris Paul and myself. Chris knows what I’m talking about. Obviously. Check out this story about Chris Paul, how he honored his grandfather, and offered forgiveness to the teens who brutally murdered him. It will no doubt move you, surprise you, and perhaps challenge you. It did me. You may not be pulling for the Hornets next year, but you will be pulling for him. I promise.